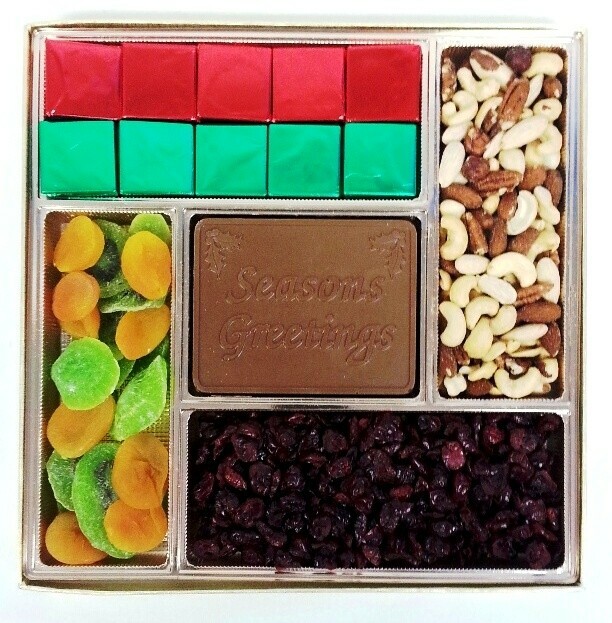 This large executive gift box contains a nice assortment of healthy snacks: dried cranberries, apricots and kiwi fruits, deluxe mixed nuts (no peanuts),dark chocolate & dark mint chocolate squares and a stock or custom logo-embossed centerpiece bar in milk or dark chocolate. Stock messages include Happy Holidays, Season's Greetings or Thank You. Includes up to 4 color process imprinted label applied to the clear cover.. Available in milk, dark, white or dark mint chocolate centerpieces.